The Avon Gorge at Bristol is spectacular in many respects and is by no means lacking in railway interest either. The two main-line railways and the now-closed railway beside The Portway under the Suspension Bridge are all worth a glance, while in the industrial sphere, the building of The Portway in the early 1920’s as an unemployment relief scheme gave work to several locomotives, the now-preserved TRYM (Hunslet 287 of 1883 amongst them. These notes though are concerned with the Paradise Bottom Tramway, which preceded The Portway by more than a hundred years. In 1795, a small neatly-shaped stone dock was constructed at the mouth of the tiny stream flowing through Paradise Bottom to the Avon, to facilitate the unloading of freestone blocks for the building of William Miles’ Leigh Court. 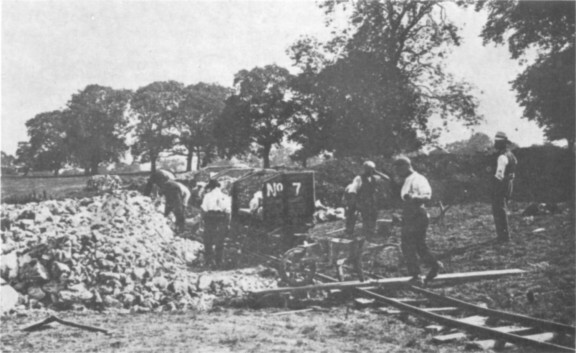 The blocks were unloaded from barges and taken up the hill through the woods on a 2ft 0in gauge tramway. Or, rather, it is believed that the tramway was laid at this date, though it does seem rather early for what was presumably intended to be only a contractor’s railway. Be that as it may, a tiny brick kiln was built near the dock and fired with culm brought from South Wales by barge. The bricks were also taken up to the Court on the tramway. A set of wagons at the head of the incline. Celestine being loaded into wagons. A barge at Miles Dock awaits its cargo of celestine. William Miles was conscious of the mineral possibilities on his estates and did mine some lead at scattered locations in the woods. This was not carried on the tramway, however, which is thought to have fallen into disuse on completion of the house. At a later date, (perhaps in about 1880) when Sir Henry Miles was Squire at Leigh Court, Mr R.B. Withers of Pill was given a free hand to prospect for minerals on the estates. Withers found that, while the lead was too scattered to be of commercial use, there were quite abundant deposits of celestine (strontium sulphate); indeed, this region subsequently became a most important producer of this mineral, with ninety per cent of the World’s output. Withers immediately opened up quarries near Leigh Court, and the dock and tramway were reopened to deal with the traffic. 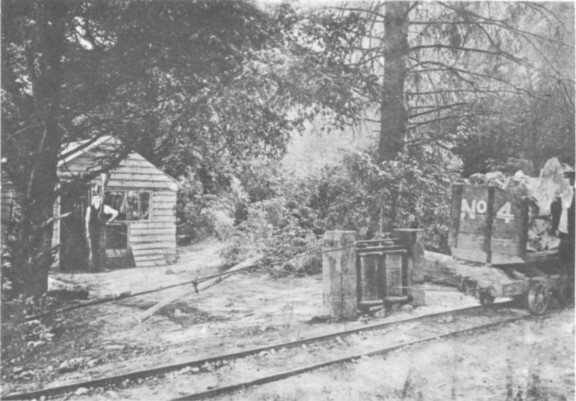 When the tramway was extended to the celestine workings themselves, Withers found difficulty in obtaining good hardwood sleepers, but astutely got round this difficulty by purchasing a couple of derelict sailing craft and utilising their timber. From this small beginning, a flourishing sideline was established; Withers bought more ships and sold the wood to local farmers for building purposes while the copper rivets and bolts went to various foundries in Bristol. A sawmill was set up to cope with this new trade. The celestine pits were in the fields north of Leigh Court and were about 20ft deep. Withers had made trials elsewhere, for example 300 yards south of Leigh Court where celestine blocks can still be seen. 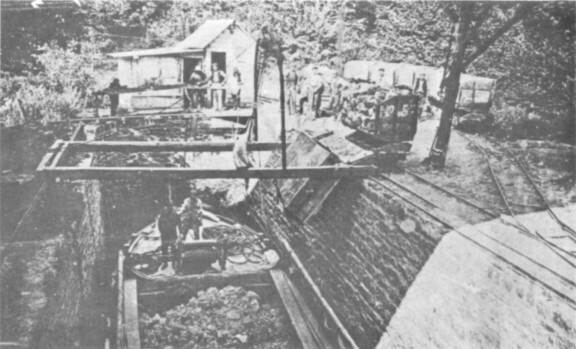 The quarries were operated by the Bristol Strontia Company which had been formed to manage these activities. Their tramway ran over half-a-mile from the pits, up to the ridge by the Court and down by gravity to Miles Dock, empty wagons being cable-hauled up the long, single track incline. Horses or hand working was the method of haulage employed in the pits themselves. The track was laid with very light flat-bottom rail, of which a tiny length still survives at the Dock. The wagons were wooden side tippers and were run in trains of four, foot operated brake gear being fitted to each wagon and operated by a brakesman who doubtless risked life and limb on the precarious ride down the hill. Quarrying was by hand, celestine being little harder than clay. At the Dock a rail-mounted chute straddled the barge, which was filled up evenly by moving the chute along. The full barge was then towed a short distance upriver where the contents were transferred to steamer for further distribution. Such a set-up could not, unfortunately, survive long in the 20th century and the entire undertaking was abandoned in about 1912. The railway was removed and though it is possible to locate the incline, there is no definite trace after that. Miles Dock can still be seen for the cost of a good walk, crossed by the GWR Portishead branch and the footpath bridge. The whole place is very derelict, and the stream flows unhindered thorough the silted-up dock. Grateful thanks are extended to the Bristol City Museum & Art Gallery for their help with this article. "STOCKSBRIDGE RAILWAY. - On Tuesday afternoon, a large and very powerful new locomotive made its first trip on the Stocksbridge Railway, which is now nearly completed. The engine is called "WHARNCLIFFE", and weighs about 25 tons."